Neutron stars are the ultra dense cores of massive stars that collapse and undergo a supernova explosion. This neutron star is located within the remains of a supernova — known as 1E 0102.2-7219 (E0102 for short) — in the Small Magellanic Cloud, located 200,000 light years from Earth. E0102's neutron star is different from most others because it has both a low magnetic field and does not have a star in orbit around it. Its remnant is also unusual because it contains high levels of oxygen like two other well-known supernova remnants, Cassiopeia A and Puppis A. 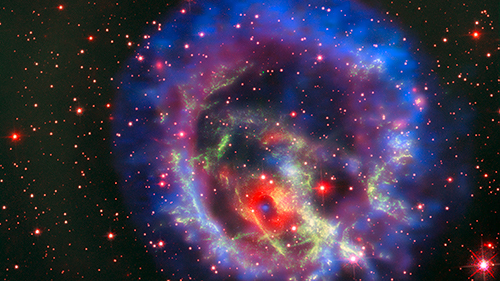 These oxygen-rich supernova remnants are important for understanding how massive stars fuse lighter elements into heavier ones before they explode. Future observations of E0102 at X-ray, optical, and radio wavelengths should help astronomers understand the origin of this lonely neutron star. 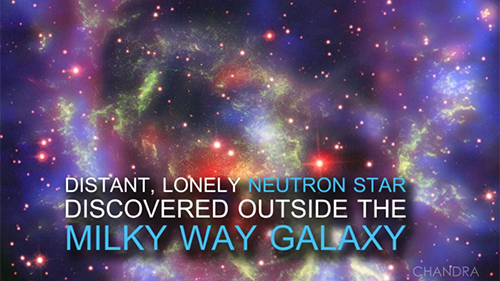 A distant and lonely neutron star has been discovered outside the Milky Way galaxy for the first time. Neutron stars are the ultra-dense cores of massive stars that collapse and undergo a supernova explosion. 1E 0102.2-7219 is a supernova remnant, the stellar debris field left behind after the giant star exploded. Data from NASA's Chandra X-ray Observatory and other telescopes points to a celestial bull's eye where the neutron star was found. Unlike many other neutron stars, this one has a very low magnetic field and no stellar companion. Astronomers will continue to observe this object at X-ray, radio, and visible light wavelengths to learn more about this cosmic oddity.